Blacklock is a most intriguing figure. Born in London, the son of a bookseller and publisher, in 1818 the family returned to Cumberland – in which county they had been established since the 1730s – living at Cumwhitton. Blacklock returned to London in 1836 and lived there until 1850. 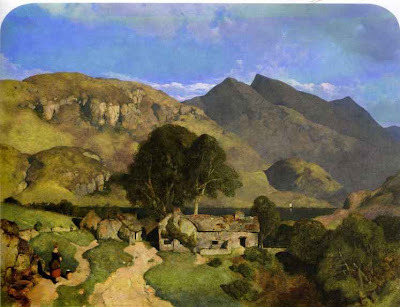 He exhibited at the Royal Academy and British Institution – generally showing north country landscapes – and gained a respected position in metropolitan artistic life, his landscape paintings being admired by Turner and Ruskin among others. He appears to have been no direct contacts with members of the Pre-Raphaelite Brotherhood, who were in any case much younger than him, but Blacklock would certainly have seen early works exhibited by members of the group and their associates. It is a matter of speculation as what European artists' works he may also have studied, with French painters such as Corot and Courbet sometimes mentioned as the inspiration of his work as a landscape painter. The light in this painting has an almost Maxfield Parrish look about it. I do agree. Good observation.